**45-day money-back guarantee is for yearly payment plans. 2 days for monthly payment plans. We had decidedly mixed feelings about our GoDaddy hosting experience. On the positive side are: unlimited bandwidth; generous disk space; cPanel 11 control panel; Installatron apps installer; 24×7 phone support; and an A+ BBB rating. The negatives are also noteworthy. The sign up process can be confusing. The renewal rates are not listed on the website. The welcome e-mail does not include the information required to set up hosting quickly. Reliability proved to be less than 100%; and server speed was slower than advertised. Despite a number of positive aspects, on balance GoDaddy has earned the NCM Online designation of NOT RECOMMENDED. Best known as a domain registrar, GoDaddy offers three low-cost shared hosting plans: Economy, Deluxe, and Ultimate. All include a free domain name for the initial hosting term, unlimited bandwidth, the newbie-friendly cPanel 11 control panel, as well as the easy-to-use Installatron apps installer. Support services are provided around the clock via phone, chat, or e-mail. As is our practice for reviewing and testing, we opted for the Economy plan which was listed at 50% off for a total cost of $41.88 for the first year. After attempts to locate the renewal rates proved futile, we called sales support and were informed that web hosting renewal rates were not posted on the site. To determine the monthly renewal rate, we were told to add today’s cost ($41.88 for a 1-year term) to the initial term savings ($42.00) and then divide by twelve months ($6.99). While we had our answer, we certainly would have preferred to see the numbers in print. GoDaddy cPanel 11 control panel. Click to enlarge. We try not to dwell on negatives, but if you plan to use a domain name you already own with your GoDaddy hosting account, the sign up process is confusing. There is no option to immediately associate your domain with the account. Further, while the “welcome” e-mail arrives within seconds of completing the sign up process, it does not include pertinent information such as the nameservers, FTP information, the e-mail settings, etc. While this information can be located after logging in to your account, it is not a fast, easy, or straightforward process. Owing to the lack of information provided with new accounts, it took longer than necessary to set up our simple 1-page test site. One distinct positive was that GoDaddy shared Linux hosting plans utilize the cPanel 11 control panel (screenshot right). It includes the Installatron apps installer. And while we had never used Installatron before, its intuitive design allowed us to install WordPress quickly and easily. 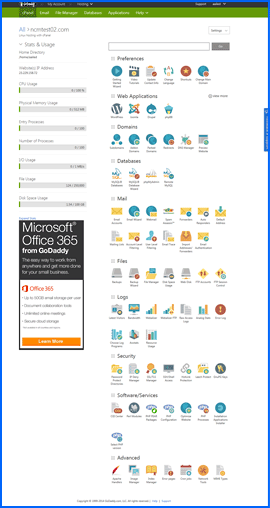 Note that GoDaddy shared Windows plans feature the popular Parallels® Plesk control panel. 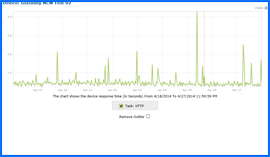 Speed and uptime testing for our GoDaddy-hosted 1-page test site began on 4/18/14 and was completed on 4/27/14 (see uptime test results chart below right). 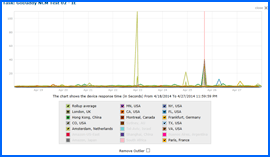 On April 25th at 4:18 PM (EST), the server began having problems. In all we received 10 TCP errors (10061) when the server began actively refusing attempts to access our test site from Colorado, Minnesota, New York, Florida, California, Montreal, London, Frankfurt, Paris, and Hong Kong. The problem continued for approximately 15 minutes. Uptime testing concluded without additional downtime incidents. In addition to affecting the reliability score, the downtime also negatively impacted speed testing results. GoDaddy 10-day Uptime Test Results Chart. Click to enlarge. Of the 13 worldwide testing locations utilized, site speed was fastest (0.7831 seconds) when accessed from Texas. Site speed was good when our test site was accessed from the U.S. locations that did not experience GoDaddy downtime problems, with an average speed of 0.8029 seconds. Site speed was slowest when accessed from Hong Kong, recording a decidedly sluggish average of 2.2527 seconds to load our test site (see speed test results chart below right). All web hosting services reviewed by NCM Online are purchased and subjected to our 10-day test for uptime and speed. Not one of the faster hosts reviewed, GoDaddy recorded a distinctly unimpressive 10-day average speed of 1.8152 seconds to load our test site from 13 locations worldwide, and an average speed of 1.2104 seconds from 7 U.S. locations. Tested for uptime every 15 minutes over 10 days, GoDaddy produced a less-than-perfect 99.8944% reliability score. GoDaddy 10-day Speed Test Results Chart. Click to enlarge. Finally, we thought it necessary to address GoDaddy’s “fastest page load times” claim. While the website does include a result chart of GoDaddy besting the competition in a server speed test, they fail to indicate whether or not the test was administered by an independent third party. Further, they fail to identify the competition by name or provide test dates (screenshot below right). These types of dubious claims by such a well-known brand are frankly, disturbing and disappointing. GoDaddy should know better. NCM Online utilizes the services of Dotcom Monitor for speed and uptime testing. Our test results to date have found a number of hosts that provide faster page-load times with their lowest-cost shared hosting plans. 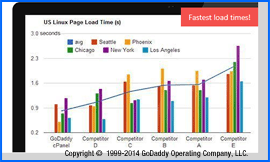 GoDaddy page load speed test chart. ©1999–2014 GoDaddy Operating Company, LLC. Click to enlarge. At times we found our experience with GoDaddy web hosting to be both frustrating and disappointing for the numerous reasons cited above. And while we continue to make use of their domain registrar services, we do not see adequate justification to utilize their hosting services. It would be our recommendation that the company spend a little less money on Super Bowl ads, and a little more on usability testing. GoDaddy has earned 3.5 stars and NCM Online’s designation of not recommended. Cheap website hosting company price comparisons based on 1-year term list price before coupon/promo codes or limited time/introductory offer discounts. These are the renewal rates for the second year of hosting. To ensure that you receive the most affordable GoDaddy pricing possible, please visit our Web Hosting Coupon Codes page for current discounts and special offers before making any purchases. **For yearly payment plans. 2 days for monthly payment plans. Best known for racy Super Bowl commercials and sponsorship of pro racer Danica Patrick, GoDaddy is the world’s leading domain registrar with (49,000,000 domains registered) and website hosting provider (5 million hosting accounts). The company has more than 12,000,000 customers worldwide, serviced 24/7/365 by 4,000 employees spread across 9 company facilities in Arizona, California, Colorado, Iowa, Massachusetts, Washington DC, and India. Using funds earned from the sale of Parsons Technology to Intuit for $64 million in 1994, GoDaddy Founder, Bob Parsons started Jomax Technologies in 1997. In 1999, the company was re-christened, GoDaddy. The following year, the firm became an ICANN-accredited domain name registrar. As the face of the company and the driving force behind its success, Parsons’ philosophy has been to provide customers with low-priced, high-quality products and services backed by outstanding, round-the-clock support. Today, GoDaddy provides its vast clientele with domain names, SSL certificates, e-mail services, and feature-rich website hosting. Fueled by annual revenues in excess of a billion dollars and a year-to-year growth rate of approximately 20%, in July of 2011, GoDaddy was sold to a group of private equity firms — KKR & Co., Silver Lake Partners, and Technology Crossover Ventures — for approximately $2.25 billion dollars. Today, Bob Parsons acts as the company’s Executive Chairman and remains a major stakeholder in the firm. All GoDaddy web hosting plans include: one free domain name, cPanel interface (for Linux hosting), Parallels Plesk interface (for Windows hosting), unlimited bandwidth, guaranteed 99.9% uptime, Google AdWords credit, Bing Ads credit, Facebook Ad credit, Fotolia Photo credit, award-winning 24/7 telephone support, dozens of free applications, and your choice of Linux or Windows servers. Vietnam veteran, Bob and his wife Renee have become leading philanthropists via their Scottsdale, AZ-based Bob and Renee Parsons Foundation. The organization has donated tens of millions of dollars to a wide range of charities and causes including the Southwest Center for HIV/AIDs, the Semper Fi Foundation (for severely wounded veterans) homeless shelters, day care centers, flood victims in Iowa, earthquake victims in Haiti, the Gift of Life Launching Program (for cancer patients), the Danica Patrick GoDaddy Domestic Violence Center, the Juvenile Diabetes Research Foundation, the YMCA, the Phoenix Children’s Hospital, Toys for Tots, the Arizona Humane Society, the Phoenix Zoo, the Boys and Girls Club, Chrysalis, HomeBase Youth Services, the Salvation Army, et al. In December of 2013, Bob and Renee Parsons joined the Giving Pledge, an organization founded by Warren Buffet, Bill Gates, and Melinda Gates. The group’s members pledge to donate 50% of their wealth to charity. This video tutorial will show you exactly how to install WordPress on your GoDaddy shared hosting account using the cPanel control panel and the Installatron script installer.